The House. The Garden. The View. Set in beautifully landscaped gardens and overlooking Hastings Old Town and the sea, this grand Victorian House offers luxurious accommodation and a peaceful environment – an ideal base for exploring the surrounding area or the perfect place for rest and relaxation. Facilities include a guest lounge, breakfast room, outdoor swimming pool and extensive grounds which include ponds, lawns, terraced seating, a herb courtyard and rose garden. 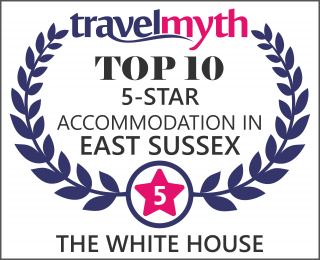 The White House is within easy walking distance of the old town, the beach and the 850-acre country park. All rooms are en-suite and include breakfast. Room rates are from £99 per night, based on 2 people sharing and include breakfast and all taxes. Sorry - no pets and no children under 5.